Looking for a fast easy way to create a relaxation slide show with favorite pictures and music on your iPhone/iPod without purchasing music or an app? The iPod Touch is a great personal device for students or clients to aid self-regulation. 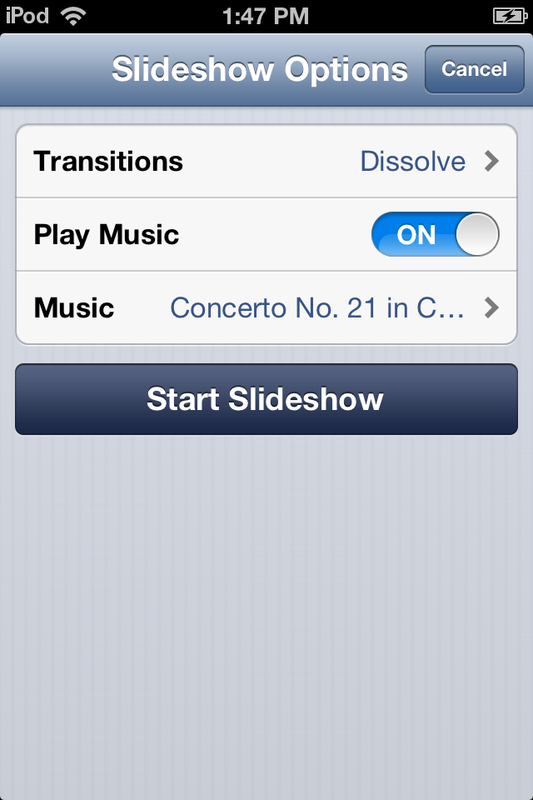 There are many apps for relaxation, calming or self-regulation but here is a simple way to create a customized relaxation slide show using favorite photos and music stored on your iPod or iPhone. 1. 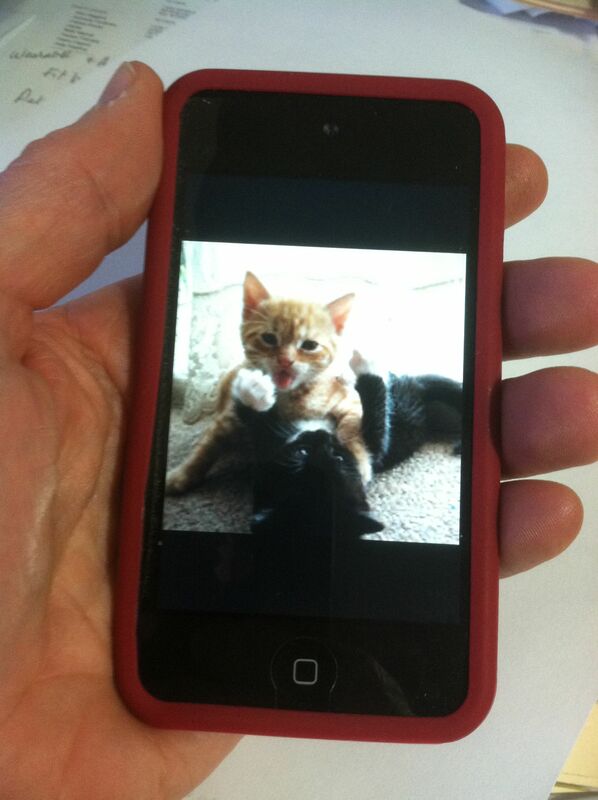 Take pictures of a favorite object or place using the camera on your device or find images on the Internet. If using Internet pictures, find copy right free images available from the Internet (see list for copyright free photo resources*). 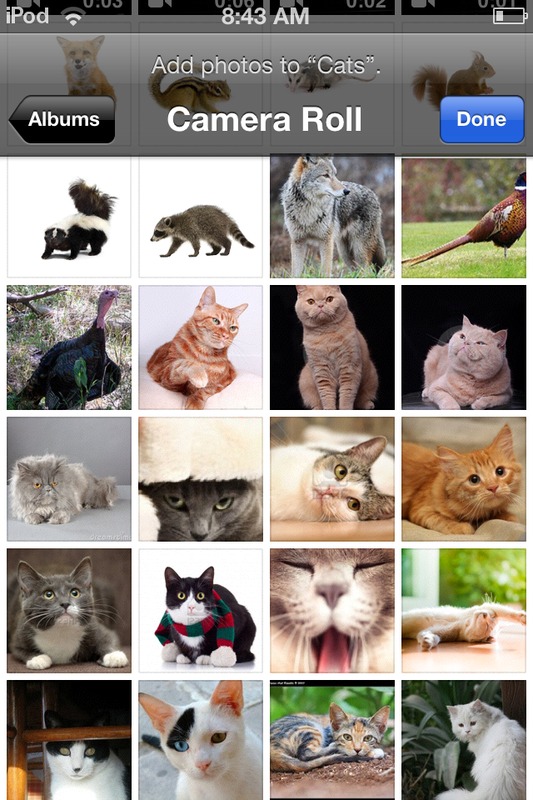 You can also easily copy Internet pictures by dwelling your finger providing the option of automatically save the image to the Photo app on your iDevice. One of the students I work with loves cats. 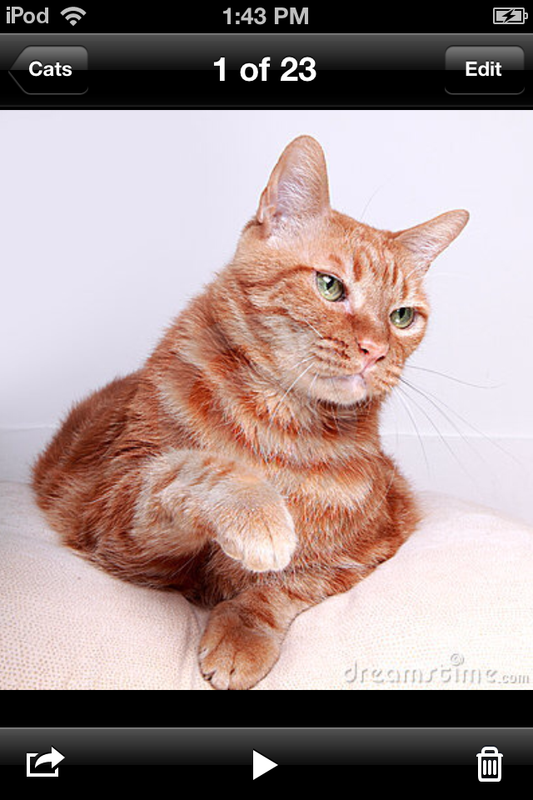 Cute cat images were very easy to find on Flickr, one of the copyright free Internet photo resources. 2. In order to create a slide show using favorite images in the iOS Photo app, you will need to go to the Camera Roll, tap on Albums to create a new album. 3. 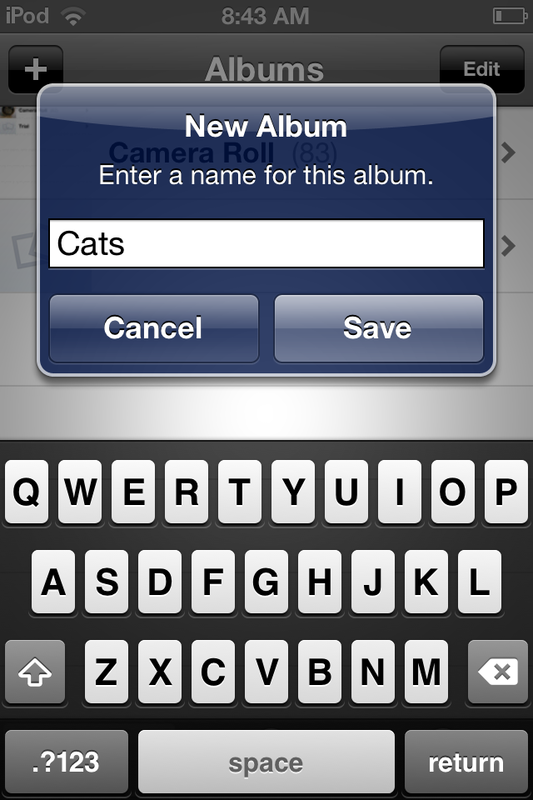 Click on the “+” button to create a new Album and give it a name (e.g. Cats). 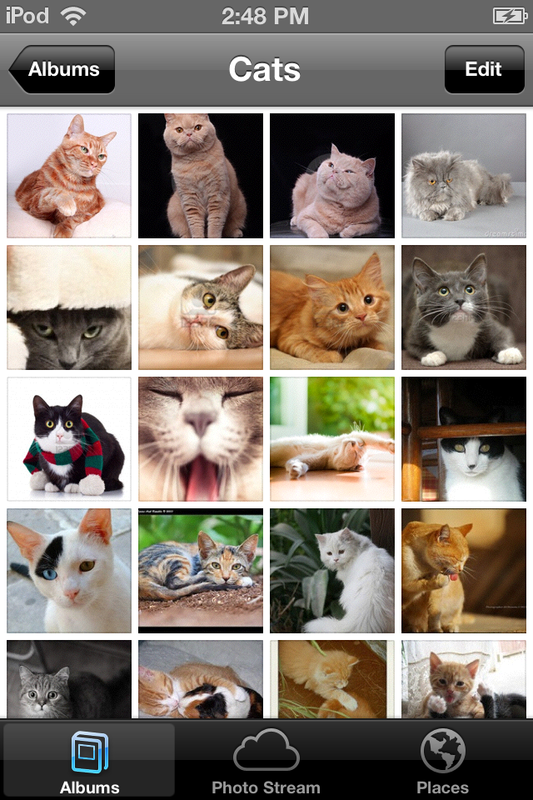 Now you can tap the “Cats” Album. 4. In your new Album tap the Add button at the bottom. You will then have the opportunity to Add photos from your Camera Roll. 5. 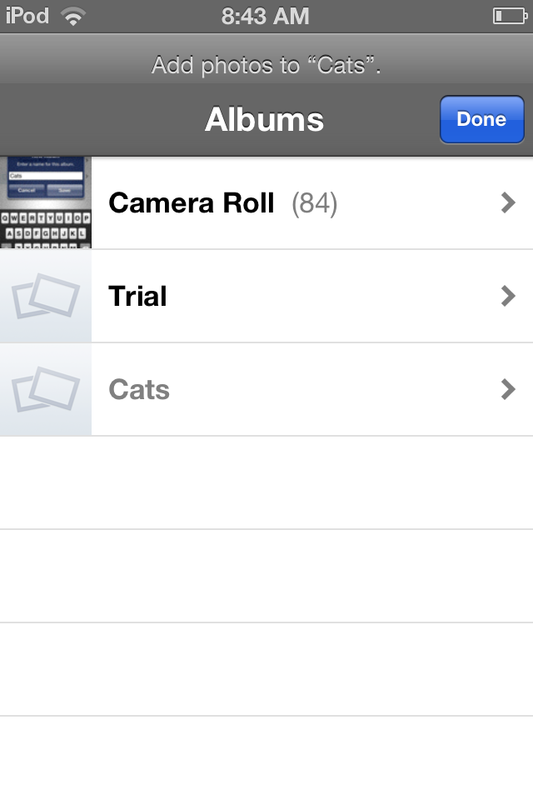 Tap on photos in your Camera Roll you want to add to your new Album (e.g. adds 23 photos to “Cats”). Tap Done and your selected photos will be added to your Album. 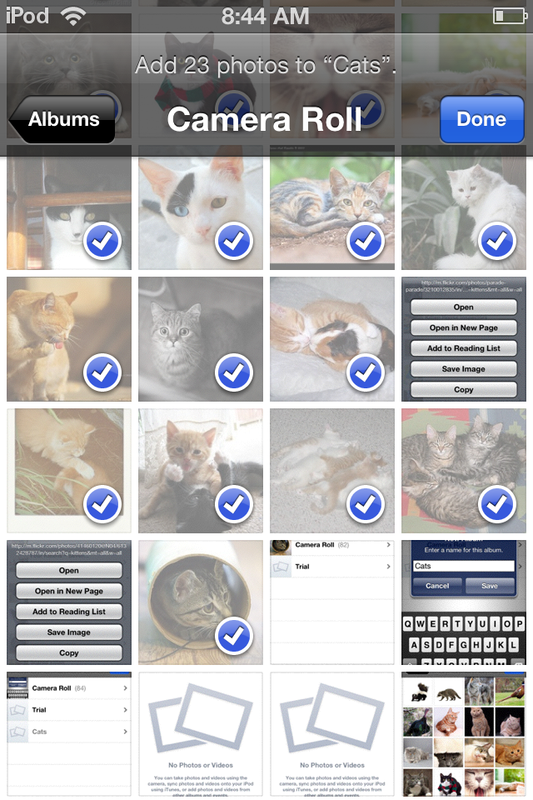 Additional photos can always be added or deleted by using the Edit button when in an album. 6. To add music to your album select the name of your new album. With the Album open, tap the first photo of the album. 7. 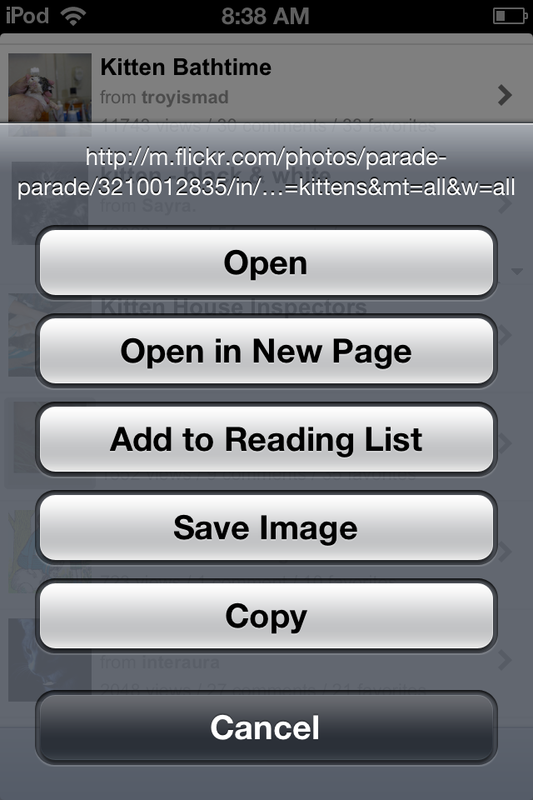 The photo opens and here is where you can add music to the slide show by pressing the play (>) button at the bottom. 8. A new dialogue box opens allowing choice of Transitions, Play Music (on or off). Slide the Play Music button to On. 9. Tap the Music button . Your music library is shown. Tap on the desired song. 10. Tap Start Slideshow. Your customized relaxation slide show is ready to go for your student or client. The music selected will remain attached to the album until you edit it. After doing this once, the process is pretty easy only requiring locating images and music prior to creating a new Album. I am using this method of providing a customized relaxation slide show using the iOS Photo app as an on demand choice of a self-regulation activity for a student at school. 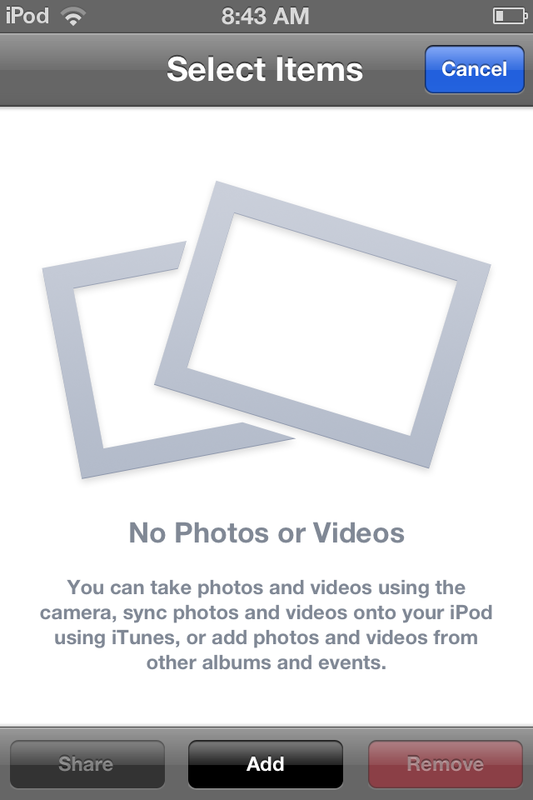 It does require numerous pictures to keep a slide show going for an extended time, but is easily customizable with pictures and music already synced to your iPod Touch as chosen by your student or client. *In need of resources to find copyright free and free images? In need of free calming music? 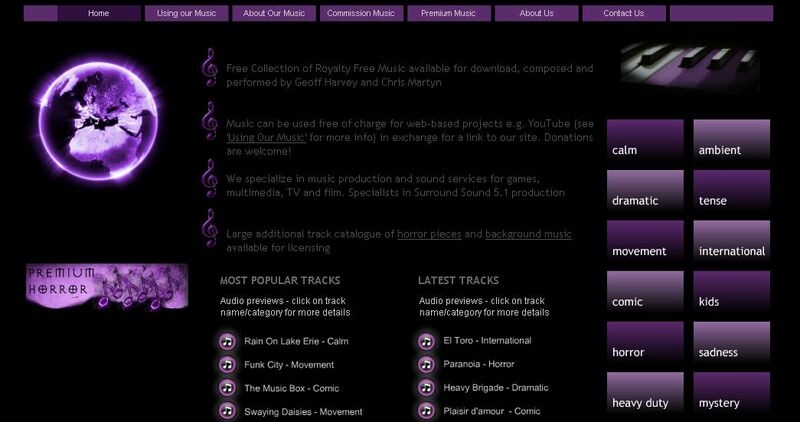 Purple Planet.com is one resource for downloading and transferring music from your PC to your iPod via iTunes. Instructions for how to upload music from your computer to your iPod Touch is found in the eHow article How to Transfer Music From my Computer to my iPod. 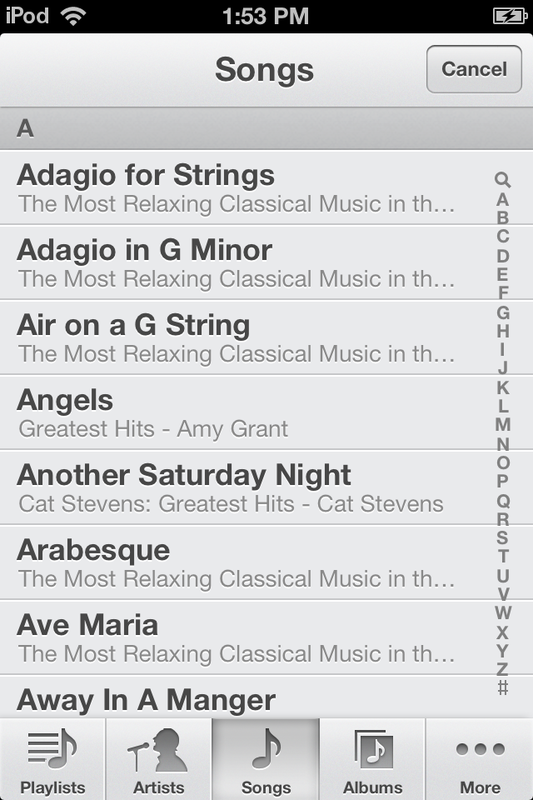 Using appropriate existing titles purchased through iTunes certainly is another easy method of accessing music. Interested in a list of calming apps for your middle to post secondary students (or adults)? Here is a link to 20 Calming Apps for Stressed out Students (and Teachers) from Edudemics. This entry was posted in App Reviews, Apps for OT's, Apps for Special Needs, Education, Emotions, High School, iPad, iPhone, iPod, Mental Health, Middle School, Music app, Occupational Therapy, Photo, Rest and Sleep, Self-regulation, Sensory Apps, Sensory Apps for ASD, Special Needs and tagged App Review, App Review sites, iPad, iPhone, iPod, Mental Health, occupational therapy, OT Apps, Rest and Sleep Apps, Sensory Apps, special needs students. Bookmark the permalink.